Cold foiling, also known as cold foil stamping, finds its place as an indoor, decorative accent. Unlike the choice of metallic labels that might be suitable as asset tags, for example, or be used outdoors, cold foiling is designed to enhance marketing efforts via its visual effects. A sparkling and colorful approach to labeling can increase visual impact and thus consumer interest. 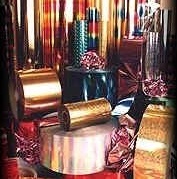 Thus cold foiling lends itself to packaging, products, correspondence, marketing materials and publications. The following are six points to consider if your goal is to create superlative cold foil labels.